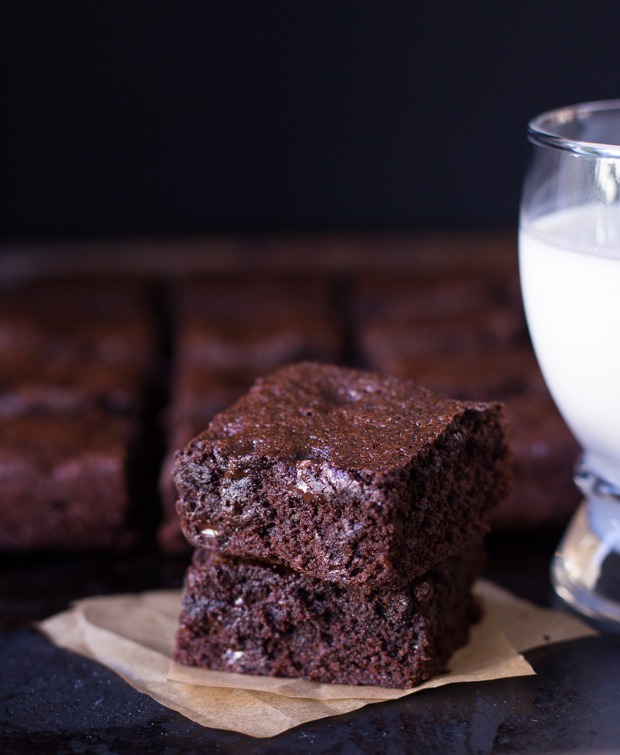 These Best-Ever Quinoa brownies are chewy, fudgy and decadent. 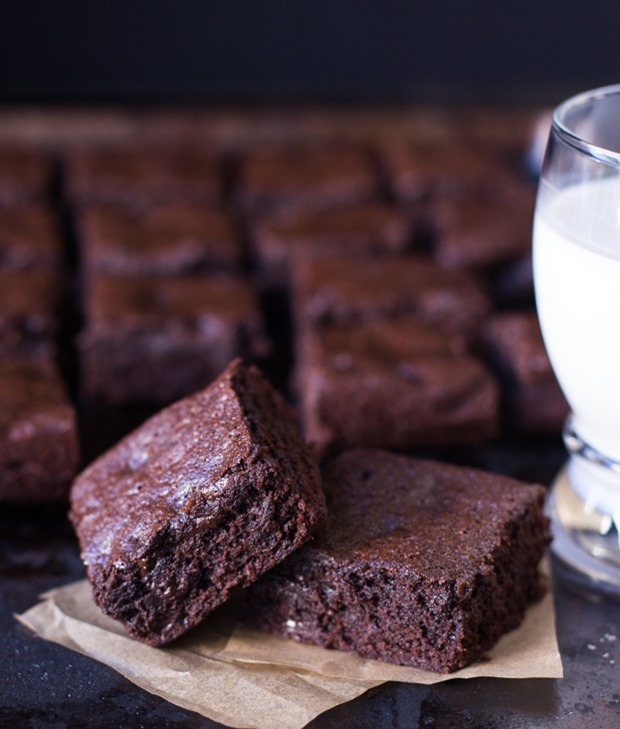 They’re dairy-free and naturally gluten-free, made without any starches or gums. I blame these on my husband. He told me that I never make brownies just because. My first response to that statement was, “Well excuse me for being too busy creating new recipes for you to eat every single week”. But then I thought to myself…you know what? He’s right. The last time I made brownies was for his birthday which happened to coincide with a blog post. Outside of that I hadn’t made brownies since before I started blogging. So, being the good wife that I am, the next day I decided to whip up a batch to surprise him with. I followed Kate’s recipe with a just a few small modifications, using spelt flour in place of whole wheat flour and vegan butter in place of real butter, because Brandon refuses to eat butter. The best part was that I didn’t have to take notes or photographs, or stress out about the results. I just followed her recipe, relaxed, and simply enjoyed the process of baking for somebody I love. That batch definitely justified the title as being The Very Best, but of course the food blogger in me couldn’t leave well enough alone. This is my life. I thought if they were that good with spelt flour then I could probably get away with a gluten-free option like brown rice flour. So I made a second batch that way and they were good but the texture wasn’t quite right. Then I thought maybe quinoa flour would work better so I tried a third batch and, oh man, it was so much more than better. 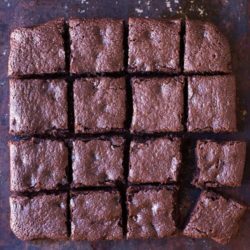 They were the best gluten-free brownies I had ever tasted. 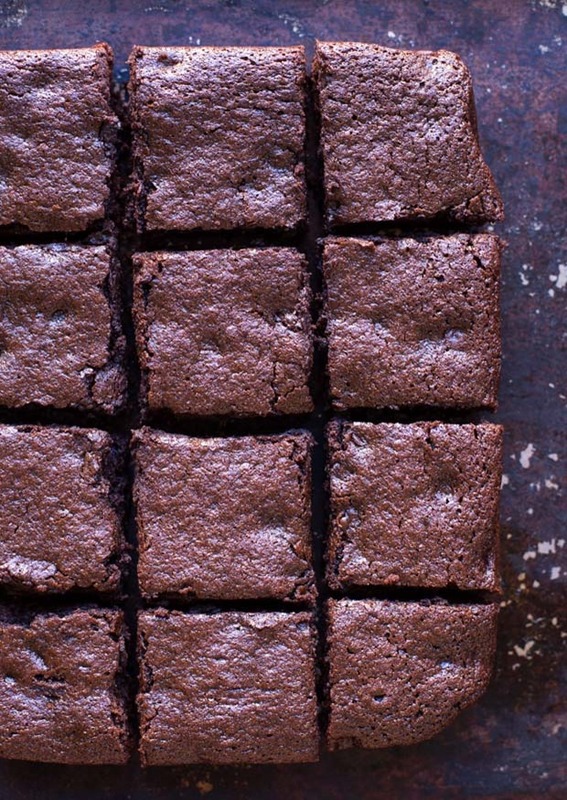 The edges are chewy and the center is rich and fudgy. And the cocoa masks the bitterness of the quinoa flour, allowing only the decadent chocolate flavor to shine through. They’re also super easy to make. Everything is combined in one skillet making clean-up a total breeze. The recipe you see here today uses 1/4 cup less sugar than Kate’s recipe and 1 stick of vegan butter plus 2 tablespoons of coconut oil in place of the butter. I continued to test the recipe from there using different ingredients but this version was by far the best. In case you are curious to try modifications yourself, I listed the ones that I have tested below (using all coconut oil, coconut sugar, and flax eggs). Spoiler alert: the first two were doable but the flax eggs were not. The texture was like brownie goo, and not in a good way. Blech. 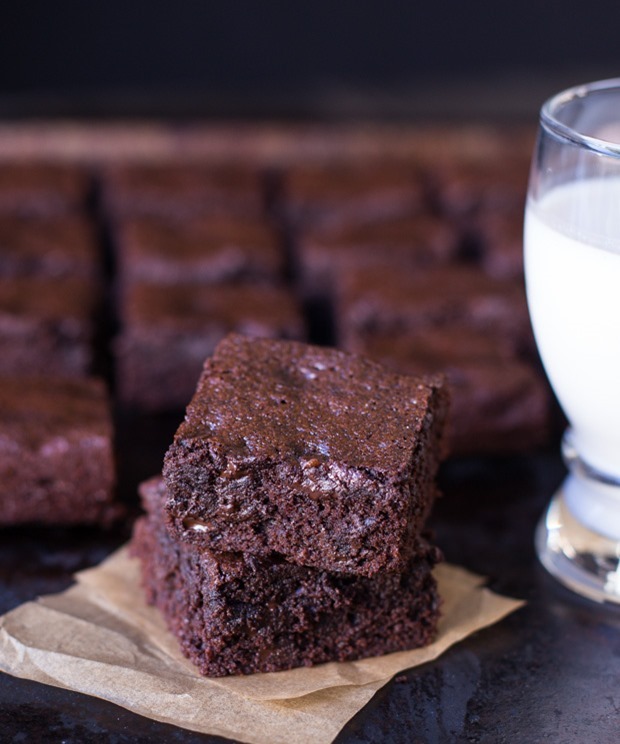 Anyways, if you’re looking for a go-to gluten-free brownie recipe that’s easy to make and doesn’t require a ton of ingredients, I have a strong feeling you’re going to love these! Preheat the oven to 350°F then line an 8 x 8” baking dish with parchment paper. Lightly spray with oil and set aside. In a large skillet over medium-low heat, melt the butter and the coconut oil together for about 2 minutes. Remove from heat and set aside. Using a spatula, stir in the sugar until well combined. Add the cocoa powder, baking powder and salt and continue to stir until smooth. Remove from heat and set the skillet aside to cool for a few minutes. Once the skillet has cooled, add the eggs and briskly stir with the spatula until the batter is thick and shiny. Add the quinoa flour and continue to vigorously stir until the batter is smooth, for about 15 strokes. 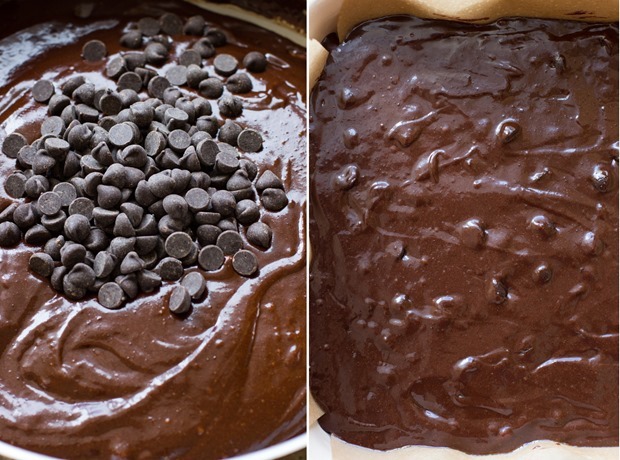 Lastly, add 1/2 cup dark chocolate chips (and maybe a few more for good luck) to the batter and fold together. Pour the batter into the lined baking dish, using the spatula to smooth it out along the edges. Bake in the oven for 25 minutes, or until you can prick a fork into the center and have it come out clean. Allow to cool for at least an hour before eating. The longer they cool, the better they will hold together. We liked the texture better on the second day so feel free to make these a day in advance. You can store them in an airtight container for up to 5 days or freeze them in a freezer-safe bag and defrost at room temperature. ***you can substitute 1 cup coconut sugar in place of the white and brown sugar but if you do that I recommend adding 1/4 cup pure maple syrup for sweetness. ****I didn’t not have good results with flax eggs. The texture was very wet, almost like they were uncooked. 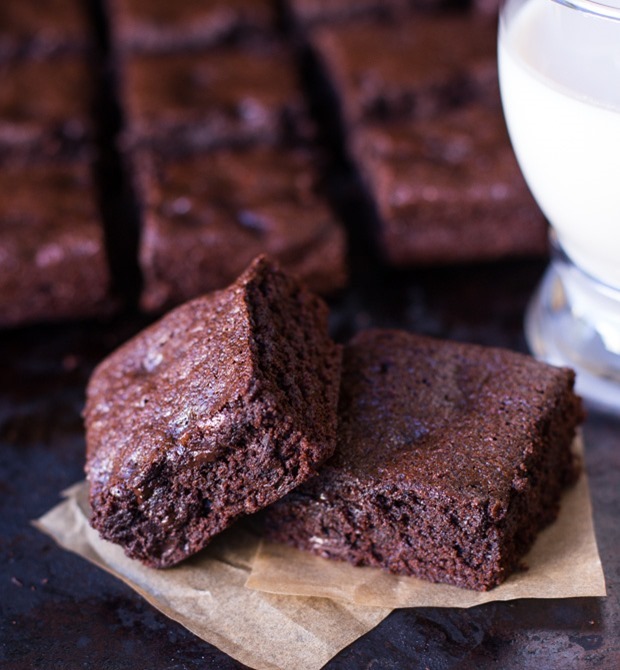 If you are looking for a vegan and gluten-free brownie, try the brownie base from this recipe.